Occupying one of the few plains in this spectacularly mountainous region of Turkey, Dalaman’s busy airport is the gateway to a region of gorgeous beaches, pretty villages, stunning mountain scenery and ancient ruins. Our selection of the best places to stay in Dalaman range from charming mountain retreats to luxurious five star hotels. Dalaman itself is quite modern and provincial and the stretches of coast closest to the airport are predictably the most built-up, with clusters of resort development around the harbour town of Fethiye and a full-scale, purpose-built resort village next to the spectacular lagoon at Ölüdeniz. Dalaman is within a short drive of two of Turkey's most beautiful beaches, Çal Beach and Ölüdeniz. Nearby Fethiye has one of the most beautiful natural harbours on the Turkish Mediterranean coast. Considering its natural assets, Fethiye is relatively small - due to its precarious position as far as earthquakes are concerned. But these dramatic, destructive moments in the town's history only make it a fascinating as well as beautiful place to visit. Fethiye is probably the only town in the world where you'll find sarcophagus in the streets that are beautifully lit up at night. These Lycian relics, like the wonderful tombs cut into the cliffs above the town, give Fethiye a totally unique look and feel. The Dalayan Delta also has some incredible rock tombs and it’s a day trip out of Dalaman. As is the sunken city of Simena at Kekova. The Dalaman region has become Turkey’s ‘soft-adventure’ playground, offering everything from diving to hang-gliding, riding, canyoning and sailing. It is traversed by the magnificent Lycian Way, a 300-mile walking trail. Saklikent Gorge is another great hiking spot close to Dalaman, as is Kayakoy, the ghost village - the ruins of a Greek village abandoned in 1923 when Greece and Turkey had mandatory population swaps. With so much on offer this is a popular area to visit. To be sure of a bed in one of the best places to stay in Dalaman do be sure to plan early and book ahead. The Kamarca House Hotel is a woodland hideaway owned by a chef, located just outside the resort. Inside antiques and contemporary furniture complement each other and whirlpool baths have been fitted as standard, outside there’s a lovely pool and terrace restaurant. If you’re looking for something a bit quirky, book the Villa Gokbel, where every bedroom is different. Some have spectacular views over the Dalyan delta and all are full of character. The Happy Caretta Hotel is an unpretentious, budget option close enough to the nightlife of Dalaman for those looking for a bit of action, but also far enough away to be peaceful. Dalaman Airport is about 7kms outside of Dalaman. Taxis or an airport transfer service are the only way to get from the airport into town but there are plenty of options. If you want to hire a car - which we highly recommend if you’re staying in Dalaman and you want to see more of the Turquoise Coast - we recommend you visit our online partner Rentalcars. Dalaman’s Mediterranean climate means the winters are mild and the summers warm. Like the rest of the Turquoise Coast, Dalaman gets about 320 sunny days a year and during July and August you can expect 12 or 13 hours of sunshine a day - though temperatures do soar to 35ºC on a fairly regular basis. If that sounds too hot for you then the months on either side are sure to please - between May and October the average temperatures are 19ºC. 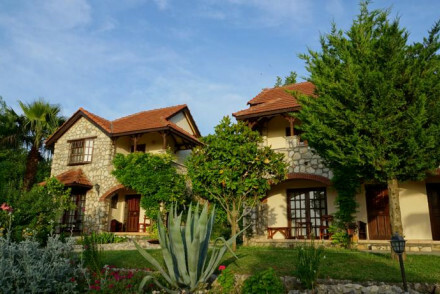 Or the best places to stay in Fethiye? A charming family-run lodge, in from the seaside resorts, but not too far off the beaten track. Set within jasmine and palm filled gardens with a pool overlooking the Xantos Valley. Simple, traditional, rooms with beamed ceilings and white washed walls. Lovely home cooked food. A relaxing stay. Total relaxation - Unwind in style at this homely lodge- bask in the sunfilled gardens, lounge by the pool or sip wine under the canopy of stars. Country Escape - A charming countryside retreat surrounded by lovely jasmine scented gardens and fringed by mountains and the sea. Birdwatching - Twitchers bring your binoculars- Patara National park is a great area for birdwatching. Great walks - Hike to the local waterfalls through lush vegatation and mountainous paths.